CLICK ON MAP FOR A LARGER VERISON. Map ©2003 Christopher J. Bessert. All Rights Reserved. Please do not copy without written permission. The US-31 highway corridor connecting South Bend, Indiana with the Benton Harbor/St Joseph area in Berrien County via the cities of Niles and Berrien Springs has always been a major route. In 1926, the corridor became home for one of the brand-new US Highway designations connecting the Indianapolis-South Bend route with the fabled "West Michigan Pike" running along nearly the entire length of the Lower Michigan's Lake Michigan shoreline. The relative importance of this route was underscored in 1938 when the US-33 designation was added from Indiana northerly to Saint Joseph. When the Interstate Highway System was being laid out during the late 1950s, a route from South Bend, Indiana northeasterly to Kalamazoo was part of the original plans. It was soon determined this corridor was not a good fit into the system and the Michigan State Highway Department asked the federal government to substitute another north-south corridor instead. What resulted was I-69 continuing northerly in the US-27 corridor from the Indiana East-West Toll Road to I-94 at Marshall. However, increasing traffic volumes along US-31/US-33 between South Bend and St Joseph foreshadowed the need for improvements in the corridor at some date. Adding to the volume was the fact that much of US-31 in West and Southwest Michigan was being upgraded to freeway standards, except that portion south of Benton Harbor/St Joseph. To the south, Indiana was also building a westerly bypass of South Bend and the northern end of this freeway was aiming straight at the Michigan state line. Under original plans put forth by the State Highway Dept., Niles was to have been bypassed by US-31 on the east, although this bypass was envisioned as an unlimited-access highway running along Seventeenth St in the eastern part of the city and tieing into the US-112/M-60 (present-day US-12) southern bypass of the city as the "wide spot" in the median near 15th St, east of the present-day M-51 interchange. After traversing the east side of Niles along Seventeenth St, the new route for US-31 was planned to turn northwesterly, cross M-40 (present-day M-51) and the Dowagiac River, then connect into M-140 north of the city. US-31 was then to have supplanted the M-140 designation through Watervliet and Covert, merging back into its existing route at South Haven. Under these plans, US-33 was to have run by itself between Niles and St. Joseph along what had been US-31, then would have supplanted US-31 from St. Joseph northerly along the lakeshore to South Haven. As the State Highway Dept. began moving forward on its easterly bypass plans for Niles, however, civic officials and local residents mounted a strong opposition, instead preferring a westerly bypass of the city. The westerly bypass, however, would have required at least one crossing of the St Joseph River—two if US-31 bypass plans of South Bend did not bring the highway to the Michigan/Indiana state line already to the west of the river—thus greatly increasing the cost of the bypass. While local leaders and residents fought the Department on its Niles bypass plans, another major fight was brewing elsewhere in Berrien Co over the plans for the US-12 "Golden Belt" bypass of the Benton Harbor/St. Joseph area. After explanations from the State Highway Dept. and even congressional hearings on both bypass projects, objection to the US-12 project began to abate, while contention over the US-31 easterly bypass of Niles only intensified. Finally, on September 29, 1956, State Highway Commissioner Charles Ziegler cancelled the bypass plans and announced a completely new survey on a US-31 bypass of the city to be undertaken in 1958. Ziegler's explanation for the change in plans was that all of the Department's funds for Berrien Co had suddenly become allocated to the US-12 (present-day I-94) freeway running between Stevensville and Watervliet. The delay in beginning the US-31 bypass of Niles allowed the planning effort by Indiana highway officials for a westerly bypass of South Bend to progress to a point where a westerly bypass for Niles became a de facto conclusion. As early as 1960, State Highway Department planning maps began showing a north-south US-31 freeway bypassing Niles to the west then turning northwesterly past Berrien Springs to an junction with I-94 west of the M-63/Niles Ave interchange at the location of the southern end of the planned St. Joseph "penetrator route." A 1970 report, begun in 1967, prepared by the Department mapped out four possible corridors for a US-31 freeway which touched off a local controversy over how the Village of Berrien Springs would be bypassed—to the west or to the east. The Herald-Palladium noted that, "during a one-year period in 1969–70, the Berrien County Board of Commissioners changed its position three times on which route it favored." As Indiana continued construction of the South Bend bypass northerly, the Michigan Department of State Highways & Transportation picked up at the state line and began constructing the freeway from there toward US-12 southwest of Niles in 1977. This first segment of the US-31 freeway in Berrien Co was completed and opened to traffic up to US-12 in 1979. From the northern end of the new freeway, US-31 was routed easterly via US-12, then northeasterly via BUS US-12 into downtown Niles, where it met up with its former route and the co-signed US-33. Planning for the next segment of freeway north of US-12 was well underway, although it would be eight years before it was completed. 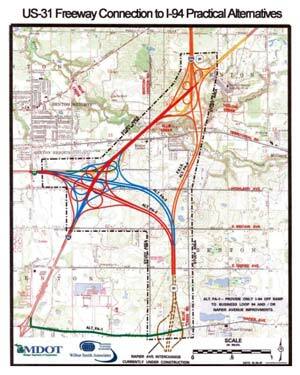 Meanwhile, with the "Niles bypass" portion of the US-31 freeway under construction, MDOT was in the process of preparing plans for the northerly extension of the freeway past Berrien Springs to an eventual connection with I-94 at the I-196/US-31 interchange northeast of Benton Harbor. After beginning the process in 1978, the department submitted their chosen route to the federal government for review and in 1981 the Final Environmental Impact Statement (FEIS) for the 19-mile segment of freeway was approved and the long, slow northerly march of the freeway toward I-94 began. It was not going to be a smooth ride, however. With the 1981 FEIS for the route from Matthew Rd northwest of Niles to I-94 northeast of Benton Harbor approved, the "Niles bypass" portion of the freeway was completed and opened to traffic in 1987 from US-12 northerly across the first pair of St Joseph River spans to a temporary terminus at Walton Rd northwest of Niles. The project limits for this portion of the highway were actually at Matthew Rd to the north, but Walton Rd, which was completely rebuilt to state trunkline standards and rerouted in part, was chosen as the temporary connector between the freeway and the existing two-lane route. A BUS US-31 route was created at Niles with the completion of this portion of the freeway. With this phase completed, the next segment of freeway to begin construction was identified as that portion from Matthew Rd northerly to the existing route of US-31 on the northwest edge of Berrien Springs. This segment would contain the second pair of St Joseph River spans. Work on the Walton Rd-to-Berrien Springs segment soon began and was completed in 1992. According to area resident Marc Fannin, this segment was opened with two-way traffic on one side of the highway in early November, with the other lanes opening to traffic approximately one week later. Motorists continuing northerly from the Niles area on the new highway expecting a fully controlled-access facility—with a matching freeway speed limit—were to be disappointed, however. The choice was made to complete and open this portion of the route as a limited-access expressway whereby no private access was allowed, but selected crossroads remained as at-grade intersections. Unlike many other states, Michigan speed laws did not make the distinction between an uncontrolled-access two-lane highway and a nearly-freeway quality, limited-access expressway. As such, the speed limit on this new stretch of highway dropped to 55 mph at Walton Rd and remained there to the end of the relocated route at Berrien Springs. Many using the highway found it difficult to keep their speeds down on such a high-quality, "freeway-esque" facility. Others, though, were happy MDOT was able to complete this portion of the relocated US-31 route in only five years and patiently awaited its conversion to full freeway standards. As an aside, the entire length of the US-31 freeway in southern Berrien Co, as well as across the state line in Indiana, was named the "St Joseph Valley Parkway" in 1993. With the Niles-to-Berrien Springs portion of the new US-31 route opened as a 55 mph limited-access expressway, work progressed on this segment in the mid-1990s to convert it to a fully controlled-access freeway. Overpasses were constructed in 1996–97 at most of the intersections—Walton, Range Line, Lake Chapin, Snow and Shawnee Roads and existing US-31—as well as full interchanges at Walton Rd, Snow Rd and existing US-31. However, the speed limit remained at 55 mph for the entire segment north of Walton Rd, as the intersection with Matthew Rd, a minor gravel country lane, remained. The year 1997 also saw the beginning of construction on the third of three pairs of St Joseph River bridges at Berrien Springs as work began on the fourth phase of the freeway to take it from Berrien Springs to Napier Ave east of Benton Harbor. After six years, Niles-to-Berrien Springs portion of the new US-31 route was finally upgraded to full freeway standards with the completion of the seemingly-unnecessary Matthew Rd overpasses northwest of Niles in 1998. This was the last at-grade intersection north of Walton Rd, meaning the speed limit on this portion of the route could now be raised to 70 mph, the recently-increased maximum rural freeway speed limit in Michigan. These grade separations at Matthew Rd were apparently deemed necessary—and enough to hold up the conversion of US-31 between Niles and Berrien Springs to full freeway standards—by local farmers who demanded their inclusion to preserve access to their fields on both sides of the highway, according to local sources. In March 2001 however, with the federal approvals in hand, MDOT began studying alternatives for connecting the US-31 freeway with I-94 in the hopes of finding both a more cost-effective and less environmentally-damaging route. In April, a US-31 Study Team began identifying and mapping so-called "known constraints" within the corridor and created a set of initial "Illustrative Alternatives" presented at a public meeting on July 18. Based on public feedback and additional study, a set of four "Practical Alternatives" were presented at a public meeting on November 6, from which the Draft Supplemental Environmental Impact Statement (DSEIS) was prepared and presented on October 30, 2002. A Final Supplemental Environmental Impact Statement (FSEIS) was prepared, recommending that Practical Alternative Two (PA-2) be designated as the preferred alternative. The 2.5-mile route of PA-2 continues northerly from the current end of the freeway north of Napier Ave, bending westerly and leaving the existing MDOT right-of-way just south of Britain Ave, crossing Benton Center Rd north of Britain and meeting up with I-94 and BL I-94 at a large, new cloverleaf interchange centered on the current Highland Ave overpass spanning I-94. Meanwhile, a 9.1-mile long, $97 million extension of the US-31 freeway was completed and opened to traffic on August 27, 2003 from the northern end of the existing freeway at Berrien Springs to Napier Ave east of Benton Harbor. This was the fourth of the five "phases" of the freeway in Berrien Co and removed through traffic off the rather dangerous former route of US-31 between Berrien Springs and I-94. This segment featured the third, and final, pair of St Joseph River spans as well as interchanges at Tabor Rd, Sodus Pkwy (Pipestone Rd relocated) and Napier Ave. This segment of the freeway was actually completed north of the Napier Ave interchange for nearly a mile to just shy of Empire Ave, though all traffic is forced to exit at Napier Ave to connect with the existing route of US-31 along I-94 to the west. While the routing for US-31 from the current northern terminus of the St Joseph Valley Parkway freeway westerly to I-94 at Exit 30 uses a rebuilt and widened Napier Ave, the roadway itself has been identified only as a temporary state trunkline routing to be assumed as part of the trunkline system only until the remainder of the US-31 freeway is completed and opened to traffic. This is a similar arrangement to ones used during the heyday of Interstate highway construction in the 1960s and 1970s, where the Department of State Highways would temporarily assume control of a roadway to serve as a bridge routing between the newly constructed freeway and the old highway. In those days, such routings were often marked on planning maps as being a "Marked and Maintained" state trunkline routing, with the local road maintaining agency (the county road commission or incorporated municipality) having the understanding that the roadway segment in question would be transferred back to their control when it was no longer needed for state trunkline connectivity purposes. As such, once the US-31 freeway is completed through Berrien Co, the expectation is the Berrien Co Road Commission will quickly re-assume control over the segment of Napier Ave between the two freeway interchanges. On October 13, 2004, the Federal Highway Administration issued its Record of Decision (ROD) which approved the location of the selected PA-2 route, connecting the existing US-31 freeway with the I-94 & BL I-94 interchange (Exit 33) east of Benton Harbor. The total cost for this final phase of the freeway in Berrien Co, which will include improvements to the one mile of I-94 between the BL I-94 and I-196 interchanges, is expected to be approximately $60 million. According to news articles, MDOT sources stated project design was to have taken about two years and 19 parcels, mostly farms, needed to be purchased. No start date for construction has been chosen as funding for the project has not yet been identified. Another indication of how long the final segment of the US-31 freeway in Berrien Co may take to complete is evident in a freeway sign replacement project from 2012. When Napier Ave southeast of Benton Harbor became the temporary connection between US-31 and I-94 in 2003, MDOT retained the signs at Napier Ave along I-94 which simply indicated "Napier Ave" at that interchange, while a supplemental sign noted traffic for "US-31 SOUTH – Niles/South Bend" was to use this exit. When the new freeway signs were installed, the primary signs for the interchange now read "US-31 SOUTH – Napier Ave." Assumedly, MDOT planners and engineers believed the signs would be in place long enough to justify including US-31 on them, likely until the next sign replacement project a decade or so down the road. According to The Herald-Palladium, in 1975 MDOT had pegged the cost for a freeway from the state line to I-94 in the US-31 corridor to cost approximately $100 million and could be completed by the mid-1980s. In comparison, the Berrien Springs-to-Napier segment completed in 2003 cost nearly that much and the final segment of the freeway to I-94 has not yet been scheduled for construction, although in 2005 its completion had been pegged at "2014 or later." (As of early-2016, though, the "2014 or later" timeframe has clearly become "or later.") The MDOT 2011–2015 Five-Year Program did specifically note, however, that the freeway connection's "design is complete and right-of-way acquisition will continue in 2011" and through 2012. Many thanks to Marc Fannin who reviewed and contributed valuable input to this article. US-31 Freeway Connection to I-94 - from MDOT, giving information on the alternatives and plans for the final phase of the US-31 Freeway in Berrien Co. The St. Joseph Valley Parkway and US-31 - a page by Marc Fannin from his Roadfan.com website. St. Joseph Valley Parkway Extension - a page documenting the portion of the US-31 freeway opened to traffic in August 2003 by Dan Garnell.